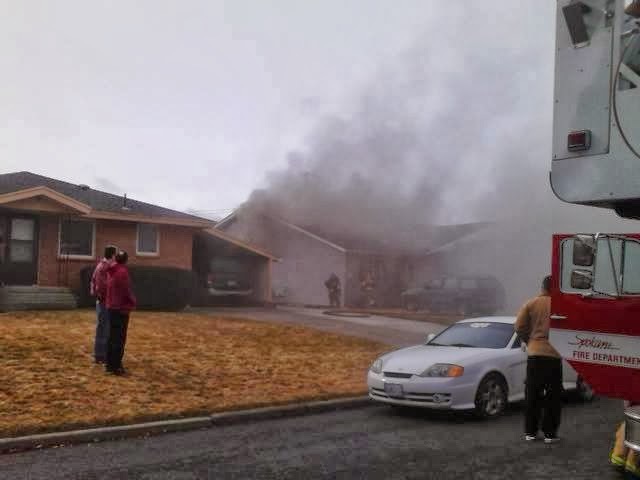 Narrative: A working smoke detector alerted residents of a north side duplex to a developing garage fire today. Residents were alerted around 11:00 AM and found a well developed fire in an attached garage. 911 was called and the Spokane Fire Department dispatched six fire apparatus and 20 firefighters to the incident. Engine 8’s crew, under the direction of Lt. Dan Awbery arrived at the fire within 4 minutes of leaving their station. Lt. Awbery reported a large duplex with heavy dark smoke coming from the east unit and garage area. Engine 8’s crew immediately stretched a hose line to the fire unit to attack the spreading fire. Upon Station 2’s arrival, Command was transferred to Ladder 2’s officer who upgraded the incident to a “working fire” and called for an addition company. Firefighters advanced hose lines inside the structure while other firefighters were assigned to search the duplex and to verify occupant safety. Additional incoming units were assigned to secure a hydrant water supply, and provide for ventilation. The quick response and decisive actions by the first arriving firefighters brought this hot fire under control within 15 minutes. Crews were on the scene for several hours removing debris and making sure the fire was extinguished. A total of 28 firefighters participated in the extinguishment of this fire. There were no injuries at this incident. 3 tenants of the involved fire unit have been displaced due to heavy fire and smoke damage to their unit. The fire damage was confined to this one unit. The cause of the fire is still under investigation. 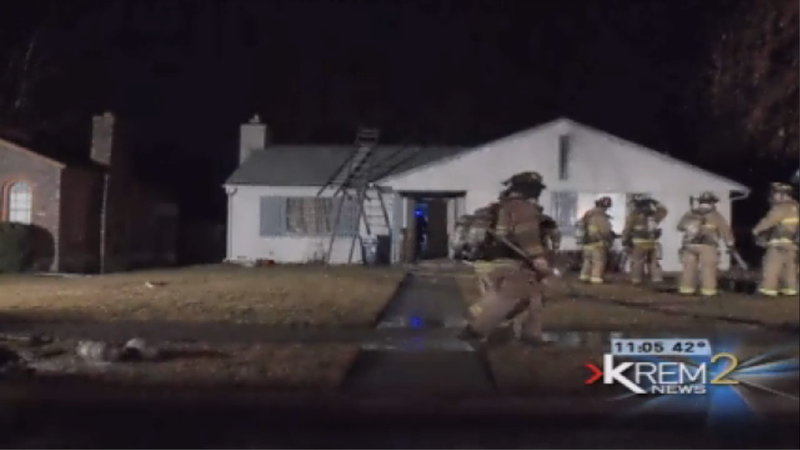 Damage: Heavy fire damage to the garage and half of one of the duplex units.. Narrative: Monday, February 17th, 2014 at 12:04 P.M. the Spokane Fire Department responded to a report of a fire in a basement located at 1827 W. 9th. Fire crews found a kitchen fire burning in a basement apartment unit that was spreading up the walls and towards the main level of the apartment complex. An occupant of the basement apartment unit was cooking on the stove when the fire grew out of control and spread to nearby walls. She received second degree burns to her face and was treated by Spokane Fire Department paramedics and firefighters. The fire was knocked down quickly and as a result, the fire was confined to the basement apartment unit including some of the wooden porch immediately above. Crews spent time performing overhaul work making sure every sign of fire was thoroughly extinguished. Cooking fires are relatively common in the city of Spokane, and the Fire Department would like to remind everyone to be attentive while cooking, have an extinguisher nearby and make sure your smoke detectors are in working order. The Red Cross was notified to provide guidance and assistance to the tenant. AMR ambulance assisted at the scene as well, as did the Avista company with natural gas and electrical concerns. Cause: Fire escaped a container on the stove while cooking. Damage: Fire damage to the adjacent walls in the kitchen area including immediate porch area above apartment unit. Fire damage to venting system and fan. Some smoke damage in the kitchen area. Narrative: On February 15, 2014 8:14 PM 6 Companies of Spokane Firefighters, 1 senior Ladder, 4 Engines and 1 Heavy Rescue responded to a residence fire at 3811 N. Calispel. S2 was first to arrive, did a 360 and reported smoke and flames showing from the rear of a single-story, single family residence. Finding a working fire in the rear of the house, companies made entry through the front and protected the home from receiving additional smoke and heat damage by pushing the fire out the back. Companies were able to extinguish the fire quickly and successfully limited property loss primarily to the rear of the home. There were no injuries reported from either residents or firefighters. Damage: Damage is primarily to the rear of the home and fairly extensive.